The Top 5 CREED: C-R-E-E-D defines what it means to be known in your community as a member of Top 5. The best real estate agents set themselves apart from the average. Top 5 identifies you as exceptional. Find answers to common questions about Top 5. 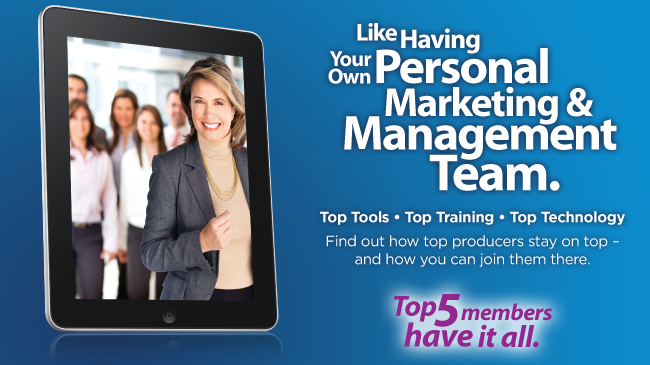 Top 5 makes two different, distinct and affordable coaching programs available to members via Workman Success Systems. Thousands of agents have achieved new levels of success through these comprehensive training programs. Learn how you can, too. You deserve to be recognized for what you are: One of the TOP AGENTS in your local market or perhaps in the entire country! Members of the Top 5 in Real Estate Network are among the Top 10% of agents in North America. Find out more! What is your unique selling advantage? World-Class Service. My goal is to have a relationship with everyone I have ever done business with 5, 10, 15 years down the road. Which means I have to provide such an extraordinary level of service with attention to detail and problem solving that my clients always come back and feel compelled to refer others. My knowledge of real estate applied to how much I care about every single client I deal with and the fact that "I never give up." That 11th hour is the difference between who gets it done and who walks away wishing it could have gone differently. What is the key to a successful life in real estate? Having a "Passion" for it. I love what I do and I love my clients. The market is always moving and changing. I feel like you have to move with it and be open to learning new things. However, when it all comes down to the bottom line - it is a people and problem-solving business. You have to be good at both. Why did you become a Member of Top 5? For the information and the networking. I learn so much from working with Top 5. The articles all go up on my website, which has helped my search engine optimization tremendously. Why is providing relevant content and information critical to succeeding in today's market? Everybody starts their home search on the Internet today. They may also hear a lot in the media about real estate. One of the reasons it is so important to provide relevant content is because real estate is local, but what they may be seeing or hearing is not local. I provide important context. Why is it essential to build this type of ongoing relationship with clients? Real estate sales are often looked at as transactional. My background, however, is in relocation, where the relationship goes on for 20 or 30 years. So I look at clients as clients for life and I want to be there as a resource for whatever they need, whenever they need it. What is your unfair competitive advantage? "My wife and I practice as a Team. We each have more than 30 years' experience in real estate. I have a Law Degree and an MBA... while Billie has been a mortgage lender and has sold and managed new construction. We bring a lot to the table for our clients." "Whether we are beginning to work with a buyer or a Seller, we see ourselves at 'Teachers' first. We believe God gave us two ears and one mouth for a reason. We pride ourselves on being good listeners. Then we spend time making sure our clients and customers understand the process they are about to enter." "Being married to someone else who lives in this crazy 'we doze, but never close' business. Client and customer expectations are so high that if my spouse were not in this business with me, things would be much harder to handle and enjoy. We work hard when we work... but we DO make time to get away." "My unique selling advantage is customer service and the willingness to return emails and respond to email leads quickly. I look at the weakness of my competition and tried to improve or take my service to another level." "Keys to a successful life in real estate is discipline and creating a balance between personal and business. Taking days off at least 1 and possible 2 days off. Hire assistance and pay him or her well with high expectations for top performance. You can't do it all and you have to be willing to share." "Marketing and advertising is what makes me stand out. I do radio show in Houston for almost 24 years and I have become a consumer champion. Sponsoring Little league teams and high school teams, TV advertisement, always looking for a way to push my brand and also looking for things that are free. Having quality marketing materials and focusing on me the person in the material." "I am the only Sotheby's representative in my area and I specialize in 'lake and lake front' homes." "I write a regular market update for the local lake magazine." "To get support from fellow minded colleagues and help with marketing." "We have a team that is set up to provide exceptional customer service. In this market properties are selling the first day they come on the market. We need to have the staff to get the property shown that first day. If you have to wait to tomorrow it is usually gone." "Call 10 clients a day. Much more important than buying zip codes on Zillow." "Highly educated. I have a college degree in real estate. The typical agent has a good 3 weeks training. My clients appreciate my education and experience. I have sold over $500,000,000 in real estate." "We have a true team culture which benefits our clients. We are able to advocate, educate, and innovate for our clients in the realm of negotiating, decision making, marketing, and understanding of the broader real estate experience...the life long real estate experience. Most agents seem to focus on the here and now, and therefor do not see further down the road for themselves or their clients. We always make sure are feet are planted in the present, and our eyes are focused on the future, this way we can truly service our clients short term and long term goals." "Passion and Balance. If you are truly passionate about real estate and your clients, then you will succeed and be great in all the areas you need to be great in order to serve your clients the best. The balance is important so that you also have a healthy life supporting that passion." "Our radio marketing is able to help us get our message out to the masses. Then our reputation and customer dedication does the rest." "Loving what I do! The fact that I enjoy everything I do within the scope of my real estate business keeps me moving forward. I don't mind working on the weekends or in the evenings because I don't look at it as a job. Our clients find they can contact me anytime, I get more accomplished because I'm not punching a clock." "Offering services that go above the crowd. High end videos of our listings, Professional HDR photos of our listings, a team of dedicated agents and office staff willing to help clients day and night. We have a moving truck that we loan out free of charge to our clients and any non profits organizations and a vender list with top trades in the area ready to help." "The key is keeping up with the ever-changing trends of technology, advertising and the market, and using them to your advantage. If you aren't aware of what's going on in the industry, you will get left behind. Combine that with reaching out to people in your community and building strong networks, you will always have a successful life in real estate." "Honesty, loyalty, accountability, and creativity is what makes me different from the real estates masses. I pride myself in the job that I do and I do my part to ensure a strong relationship with my clients I sell homes to and for. I have not only committed myself to my industry, I have committed myself to my community by becoming heavily involved in political trends in the area and constantly giving back. " Top 5: Front Page News!